An Australian native stingless bee species declares war on its neighbors by launching swarms of bees that lock hive-defenders in a death grip with their jaws so that both combatants die. They may be tiny and stingless but there's nothing sweet and innocent about a species of native sugarbag bee when it goes to war over a coveted honey-filled hive. 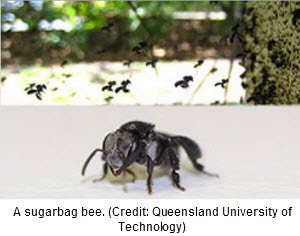 A study by behavioural ecologist Dr Paul Cunningham, from QUT, and molecular biologist Dr James Hereward, from the University of Queensland, published inAmerican Naturalist, found the bees' used their jaws as lethal weapons when they zoomed in on a neighbouring Brisbane hive to boot out the inhabitants and install their own queen to rule. Dr Cunningham said the attacking bees arrived in a swarm and clashed jaws, locking the defenders in a "death grip" with their strong mandibles. "Neither the attacker nor defender survives in these one-on-one death battles, during which a carpet of dead and dying bees can be seen on the ground. It is a sheer numbers game as to who wins," Dr Cunningham said. "It took three consecutive attacks over several weeks before the hockingsi bees won out. "When they eventually broke through the defences, they smothered the hive in a huge swarm, mercilessly ejecting the resident workers, drones and young queens. It was carnage!" Dr Hereward said they had expected to find two colonies of the same species at war. "The defending colony was, as we expected, Tetragonula carbonaria, but the attacking colony turned out to be a related species originating from further north, called Tetragonula hockingsi." Dr Cunningham said the hive then settled down and there was no further fighting for several months, so they opened it up and looked at the genetics of the new brood. "There was a new queen in residence, and she was a daughter of the attacking colony's queen." The researchers studied more than 250 hives around Brisbane and found evidence of 46 of these all-or-nothing take-overs over five years. "And the hockingsi bees are not always the winners," Dr Cunningham said. "We still have many questions to answer, such as what instigates the attacks, and whether the young in the usurped hive are spared and reared as slaves, or killed outright." Dr Cunningham said stingless bees were important pollinators and with honeybees threatened, the race was on to better understand these bees' habits of mid-air warfare and territoriality.